DLBCL is an aggressive B-cell lymphoma, and is the most common NHL, accounting for a third of all cases . DLBCL is clinically, pathologically, and genetically diverse. Two principal DLBCL molecular subtypes have been defined by gene expression profiling: germinal centre B-cell (GCB) and activated B-cell (ABC). Each subtype is associated with a distinct clinical prognosis . Tumour classification using immunohistochemistry algorithms (e.g. Hans, Choi and Tally) have been proposed as surrogates of gene expression profiling, but are not in routine clinical use . DLBCL can be cured in more than 50% of cases . The International Prognostic Index (IPI) is a clinical prognostic score for aggressive NHL including DLBCL . However, there is a need for additional prognostic markers in DLBCL to identify patients likely to relapse after immunotherapy or fail to achieve remission. Figure 31.4. 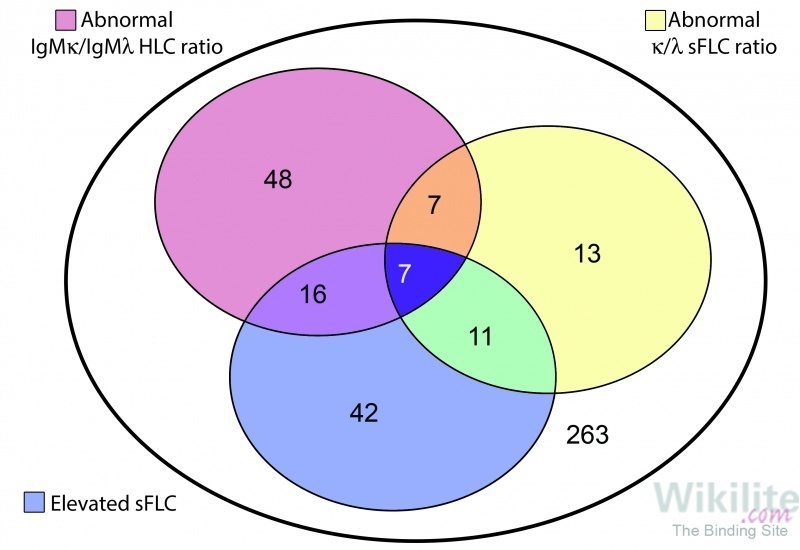 Venn diagram indicating the distribution of DLBCL patients according to κ/λ sFLC ratio, sFLC concentration and IgMκ/IgMλ HLC ratio. Chart generated using published data. Although most cases of DLBCL are light chain restricted, only a minority of patients have sFLC abnormalities. Between 9 and 14% of DLBCL patients have an abnormal κ/λ sFLC ratio and between 19 and 32% have elevated κ and/or λ sFLCs . Of the patients with elevated sFLCs, approximately 25% have monoclonal sFLCs (with an abnormal κ/λ sFLC ratio) while the remainder have polyclonal sFLCs (with a normal κ/λ sFLC ratio) . Jardin et al. characterised serum IgM, IgG and IgA HLC in DLBCL. An abnormal IgMκ/IgMλ, IgGκ/IgGλ or IgAκ/IgAλ HLC ratio was observed in the sera of 19.1%, 6.4% and 2.9% of patients, respectively . This is consistent with the relative frequencies of B-cell receptor isotype expression by DLBCL cells . The most frequent HLC abnormalities were reduced serum concentrations, observed in 11.2% (IgMκ) to 21% (IgGκ) of patients. There was little overlap between patients with sFLC and IgM HLC abnormalities (Figure 31.4 ). Patients with an abnormal IgMκ/IgMλ HLC ratio had an increase in Cμ mRNA expression and a higher rate of IgM positive cases by immunohistochemistry compared with patients with normal HLC ratios . Therefore, in the absence of any coexistent monoclonal gammopathies (e.g. monoclonal gammopathy of undetermined significance, Chapter 13), the source of a monoclonal protein in DLBCL is likely to be the tumour. 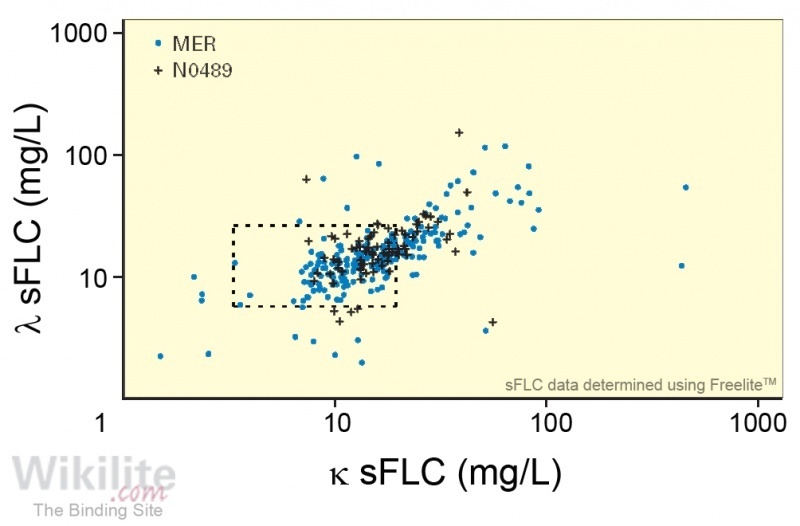 Figure 31.5. sFLC concentrations in two cohorts of DLBCL patients (MER and N0489). Dashed box indicates normal range. (Originally published by the American Society of Clinical Oncology). Figure 31.6. Kaplan-Meier survival curves for two cohorts of patients with untreated DLBCL (MER and N0489). (Originally published by the American Society of Clinical Oncology). Figure 31.7. Overall survival according to IgMκ/IgMλ HLC ratio. (Reproduced with permission from Leukemia & lymphoma and Informa Healthcare ).
) . The prognostic significance of elevated sFLCs persisted for a total of 6 years of follow-up . Elevated sFLCs remained significantly associated with reduced OS and EFS after adjusting for the International Prognostic Index in both the N0489 (both p<0.02) and MER (both p<0.001) cohorts. The prognostic utility of elevated sFLCs has been confirmed in other studies . Witzig et al. reported that although DLBCL patients with monoclonal sFLC elevations tended to have poorer prognosis compared with that of patients with polyclonal sFLC elevations, this did not reach statistical significance. Moreover, monoclonal sFLCs predicted for ABC-type DLBCL: in all, 73% of patients with monoclonal sFLC elevations were of ABC-type (by the Hans algorithm) compared with 33% of patients with normal sFLCs . By contrast, polyclonal elevations or normal sFLCs were not associated with a particular molecular subtype. Elevated sFLCs were more common in patients with elevated serum creatinine (58%) than in patients with normal creatinine (29%) . Interestingly, the association of elevated sFLCs and poor outcome was strengthened in the subset of patients with normal creatinine (n=241, OS Hazard Ratio 4.09, p<0.001), while there was no association of elevated creatinine with outcome (n=40, OS Hazard Ratio 1.00 p>0.60). This suggests that the association of sFLCs with outcome was not related to renal impairment. Jardin et al. studied the prognostic utility of HLC analysis in a cohort of 409 DLBCL patients enrolled on the LNH03-B clinical trial program of the French GELA study. Abnormal IgMκ/IgMλ HLC ratios and IgGκ/IgGλ HLC ratios or elevated IgMκ or IgMλ were each associated with significantly unfavourable outcomes. 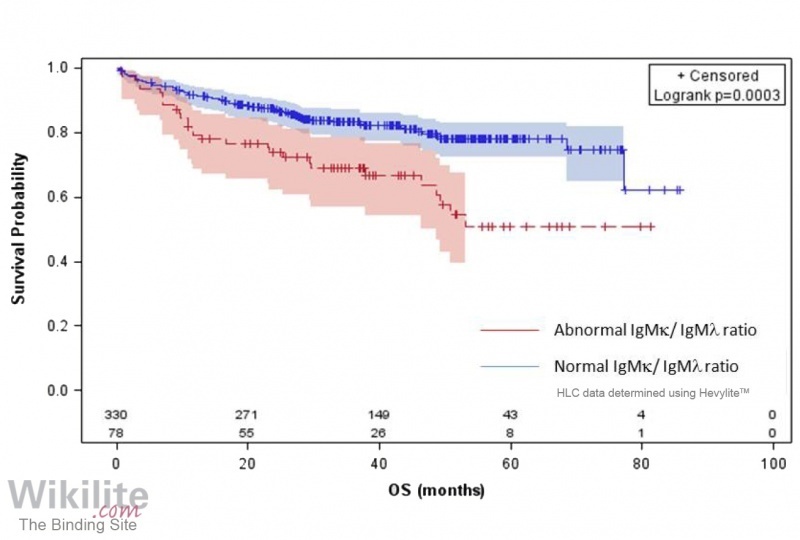 For example, patients with abnormal IgMκ/IgMλ HLC ratios had a 5-year OS of 50.8% compared with 78.1% for patients with normal IgM HLC ratios (p=0.0003, Figure 31.7). In multivariate analysis, which included six sFLC and HLC variables identified in univariate analysis, only an abnormal IgMκ/IgMλ HLC ratio remained predictive of progression-free survival (PFS) and OS. In a separate multivariate model, including IgMκ/IgMλ HLC ratio and IPI score, the IgMκ/IgMλ HLC ratio remained predictive of PFS (p=0.03). The prognostic value of IgM HLC was also confirmed by Johansson et al. , who studied 187 patients with aggressive lymphoma, of which DLBCL accounted for the majority (67.9%) of cases. An abnormal IgMκ/IgMλ ratio was observed in 20% of patients, and was associated with adverse clinical characteristics including advanced Ann Arbor stage (p=0.005), high international prognostic index (p=0.001) and extranodal disease (p=0.003). An abnormal IgMκ/IgMλ ratio also predicted a shorter time to treatment failure and OS, and remained prognostic on multivariate analysis. Figure 31.8. Serial sFLC measurements in a patient with λ-restricted DLBCL who relapsed 9 months after treatment. (Originally published by the American Society of Clinical Oncology. Maurer et al. evaluated the use of sFLCs for monitoring DLBCL in the N0489 trial. 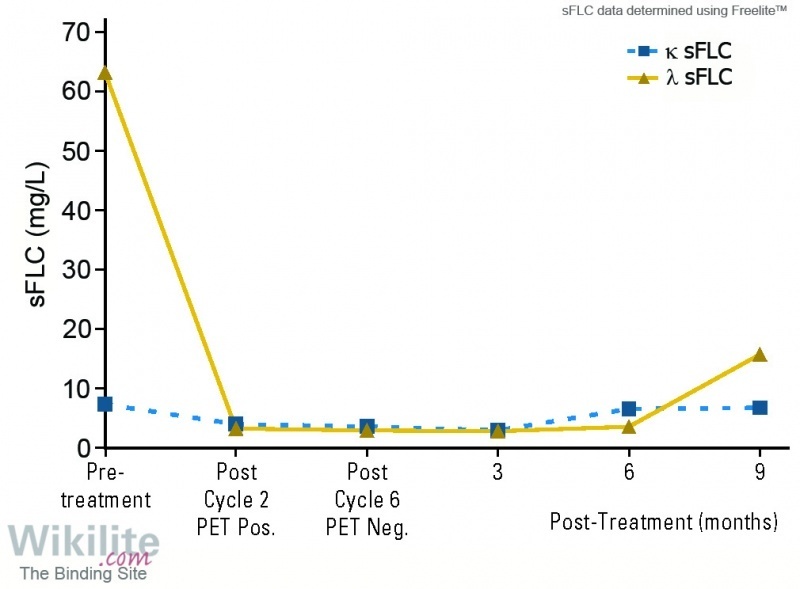 Pre- and post-treatment (cycle 6) sFLC measurements were available for 11 patients with κ- or λ-restricted tumours. Analysis of these samples revealed that, post-treatment, a greater reduction in the involved sFLC concentration was observed compared with the uninvolved sFLC (p=0.03). Serial monitoring samples were available for one λ-restricted DLBCL patient (Figure 31.8.) . The pre-treatment levels of λ sFLCs were highly elevated, with normal levels of κ sFLCs. λ sFLCs normalised after two cycles of treatment and the patient achieved a PET-negative complete response after six cycles. However, at 9 months post-treatment, λ sFLCs had increased, and tumour imaging and biopsy confirmed disease relapse. κ sFLCs remained unchanged throughout. This case illustrates that changes in the DLBCL tumour itself may directly influence changes in the corresponding sFLC.